The above is the key data. A take on it from Tyler Cowen’s Marginal Revolution here. I’ve been familiar with these reports for some time. When I was serving on the National Library of Medicine’s Board of Regents, Michael Lauer presented this more nuanced version of the finding, here. NIH Study Sections to go blind? As in peer review, story here. If it happens on a large scale, it’ll be a huge deal. Another ice storm here in the Washington DC area. 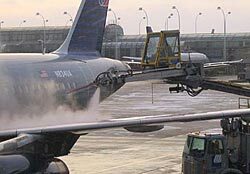 The last one, about a week ago produced complete chaos in the largest freeway interchange–so the rumor is this time they are ready with those trucks they use at airports to deice jets. Hmmm. I think I’ll stick with the surface streets. More interestingly, NIH is out with a new plan to peer review grants. You can see the Chronicle’s take on it here. One questions how a new peer review plan can put a dent in what amounts to a slow collapse of research funding at the agency.